Precision Electro-Mechanical Engineering Turns Theatrical Art into a Science. The Electro Kabuki system designed by Magnet Schultz Ltd delivers a uniquely reliable and modular system for staged curtain drops and reveals, known as ‘kabuki drops’ in the theatrical effects industry. By applying its rigorous engineering design and development principles to the challenges of theatrical reveals, MSL has made kabuki drop effects dependable and desirable. From small theatre workshops and private product launches to prestigious concerts and Olympics-style opening ceremonies, there’s no room for error. But that was a common experience with kabuki drops in the past. Frequent failures due to unreliable equipment led to a poor reputation. That changed with the arrival of Electro Kabuki (EK). EK modules use powerful electro-permanent magnets, manufactured in our state-of-the-art production facilities, to retain a load hook. When de-energised, the magnet holds the hook firm. However, a short electric pulse to the magnet overrides the flux and ejects the steel armature mounted on the load hook. Using a magnet overcomes the problem of side loading associated with a pin and solenoid arrangement. The energise-to-release device also avoids unwanted releases should the power fail. The low energy requirement of this type of magnet means up to 200 EK modules can be controlled by a single firing box, allowing a very long drape. The load hook is carefully profiled to avoid snagging. It supports up to 50kg yet releases faultlessly even with no load due to the use of a remanence spring. 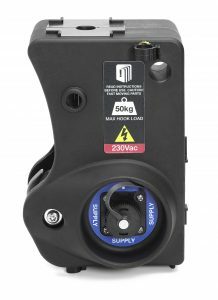 The load arm can be restrained by a safety tab to provide safe testing and prevent accidental firing. Electro Kabuki is more than a set of modules holding drapes or theatrical props. It is a complete closed-loop automation system, with all components supplied. EK is controlled by a range of firing boxes. Interconnection between modules and to the firing box is by fool-proof colour-coded cabling, available in a variety of lengths and fitted with IP65 twist-lock connectors. Electro Kabuki firing options range from a basic box with simple push-button operation to sophisticated DMX firing boxes that integrate with the staging crew’s master control system, using industry-standard DMX protocols. This allows kabuki drops to be precision-timed with other effects or staged on cue with music or live action. In the DMX/Sensing firing box, MSL has designed-in extra functionality. Visual indicators on the firing box prove electrical continuity and that the system is fully armed. At module level, a solid blue LED on the underside shows that the module is powered, and the safety tab is off, so the module is ready to fire. A flashing LED indicates that the safety catch is on, which would restrain the hook. Any electrical discontinuity is identified by an extinguished LED, which saves EK users significant time during big installations. Innovative design means that all firing boxes can address EK modules on two separate firing circuits, but with signals carried along the same link cables. Each module is factory-set as ‘Circuit 1’ or ‘Circuit 2’. The basic firing box features a rotary switch to select and fire Circuit 1 or Circuit 2 modules separately, as well as a setting to fire all modules simultaneously. Separate drop functionality using circuits 1&2 permits two-stage kabuki drops to be performed, allowing phased drops and special effects such as ‘flop & drop’. A splitter box allows two or three strings of EK modules to be rigged in parallel. 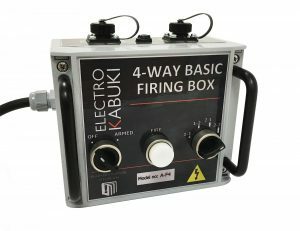 A new 4-way firing box allows four separate strings of module to be fired independently. MSL designed the EK system to be quick and easy to install. That was essential. The system is scalable up and down: the modular approach ensures this. System operation is straightforward: push button and rotary switches keep the basic firing boxes simple. DMX integration for automated firing is a plug & play function. But most of all, Electro Kabuki is completely reliable. Staging and events professionals can now adopt kabuki reveals as dependable special effects. Only specialist engineering expertise could achieve this. 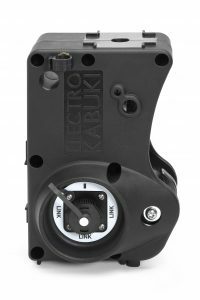 Electro Kabuki is rugged, robust, weatherproof and built to survive the physical abuses of the event staging industry. EK is now used around the world to provide spectacular reveals for high-profile artistes, touring troupes, sporting and corporate events, churches, schools, circuses, theatres and pop concerts – all delivered with reliable engineering precision. Find out more on the Electro Kabuki website.